Christmas came and went without me blogging for such a long time. So....I am going back in time to Christmas 2011. The colour scheme I chose was blue and white, inspired by some digital paper. The images used were shaded predominantly in blues with a few other colours incorporated. Below are a few of the cards I made. I used several Lili of the Valley stamps and a Wee digital stamp. I used the Wee digital stamp in the last photo for a Pink Christmas card swap I joined on RSA. I dare say I was more into pastel colours than the traditional colours this year. I will post some of the cards from the pink swap next time. Enjoy the rest of the weekend. The weather in Cape Town is 30 degrees with no wind today - absolutely stunning day. I am off to prepare salads to go with the fish braai we will be having a little later. We have invited my mom and David's parents. Enjoy the rest of the weekend, which seems to fly by as fast as the working days! Here is another card I made recently for Sally Leach, very talented lady, who moved to a new home. We have never met but have been sending cards and letters to each other for over 15 years. It is also a Lili of the Valley image which is just so cute. I could make cards all day using all these beautiful stamps. Hi all, after a very long break from blogging. Time is so precious and we often don't have enough of it to do the things we love. However, I am so grateful for the time I do get to spend on my special hobby. Below is a tent card I made for Ria, one of my RSA Group friends. 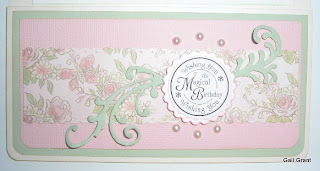 It is an idea I got from Sandra Fullerton, who made a card like it for our Stamping Group. I loved her card so much so I copied it using different lace etc. The most difficult part of making this card for me was to get the little piece of chain attached to make the image dangle! The image is a LOTV stamp which I stamped at Amanda Harrod's house on one of our fabulous Saturday morning get togethers. She just fitted the card so well. I hope I will be back with some more cards soon. Lynn Cupido, Shamela Hendricks and Joyce Hessen hard at work! Lynn holding up the little hat which slides up to hold a gift card. Here Debbie Harris and her daughter, Sasha are taking a breather while waiting for the next dem to begin. And... last but not least....Sandra Fullerton and Amanda Harrod. 11 Ladies from Cape Town celebrated WCMD at Debbie Harris' house on 1 October 2011. We enjoyed a most awesome day together. Each person prepared a demonstration and brought pre-cut packs for all the ladies to make on the day. On arrival we enjoyed champagne and orange juice and had a short time to purchase goods displayed by some vendors. We then took our seats where a pile of gifts donated by vendors, shops and friends awaited us. The day was action packed with a delicious lunch, afternoon tea, lucky draws and wonderful dems. Below is the card holder box which I demonstrated. I will feature more photos and goods that we made. Well, once again I have had a long absence from blogging. I wish knew where the days went. It's hard to believe we are already in October. September seemed to fly by so fast - quite frightening! 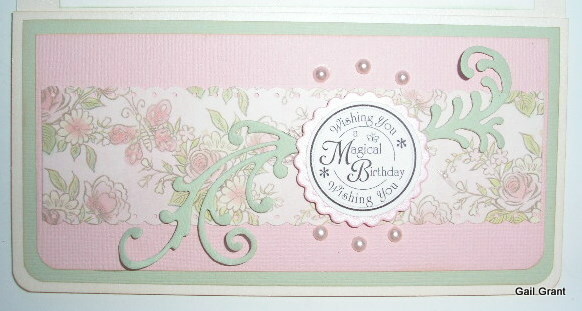 It was a very busy month, workwise, my mother's 90th birthday and preparation for World Card Making day on 1st October. After my last post I made several different cards with a similar design. Here is another one which I made for a male. I just love the image.